As the editor of FOH, I am frequently asked for my insights into the health of the live audio industry and where it’s headed. If you queried me about the recording side of the business, the picture is quite different, as that side seems driven toward lower-end products accompanied by dozens of higher-end outboard offerings from boutique companies. When is that last time you recall seeing the launch of a large-format studio console? 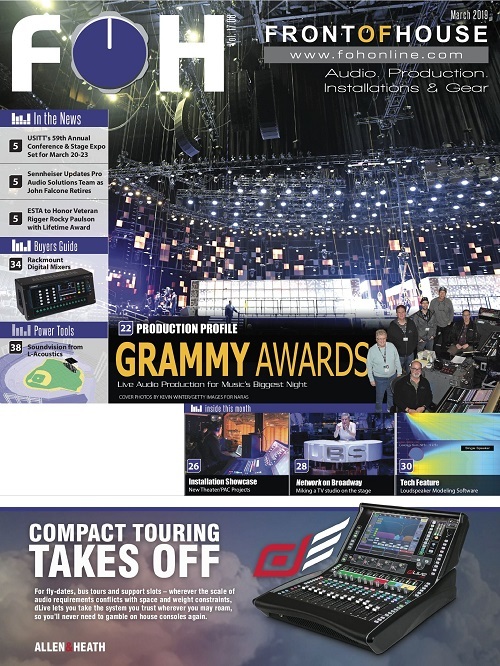 Meanwhile, recent developments in sound reinforcement technology — ranging from compact line arrays, new DSP plug-ins and measurement systems, to network control, Wi-Fi mix and system controllers — have created an exciting time in the industry. 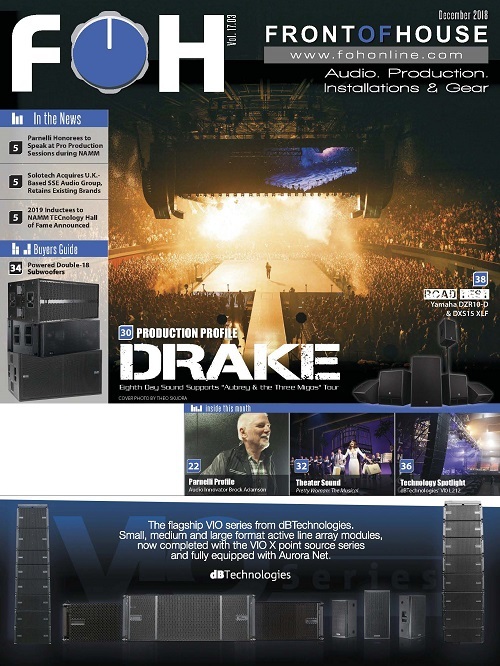 Today, in markets ranging from smaller venues, theaters and churches (of all sizes) to sports venues and huge concert rigs, the push is on with more inputs, larger consoles and a new emphasis in multi-output systems that deliver an immersive spatial environment to the audience. Despite modest improvements in the economy, there’s definitely light at the end of the tunnel with measurable factors pointing in an upward direction. System installations continue at an increasing pace, especially in houses of worship, performing arts centers, theaters, clubs and sports facilities. The “fan experience” is essential to keeping those seats filled and audio excellence is a major factor in that equation. And the positive vibe regarding recent tradeshows, particularly AES, InfoComm and this month’s NAMM Live! reflects genuine enthusiasm among users for new sound reinforcement product launches. Besides the obvious, there are inherent differences between the worlds of live and recorded sound. 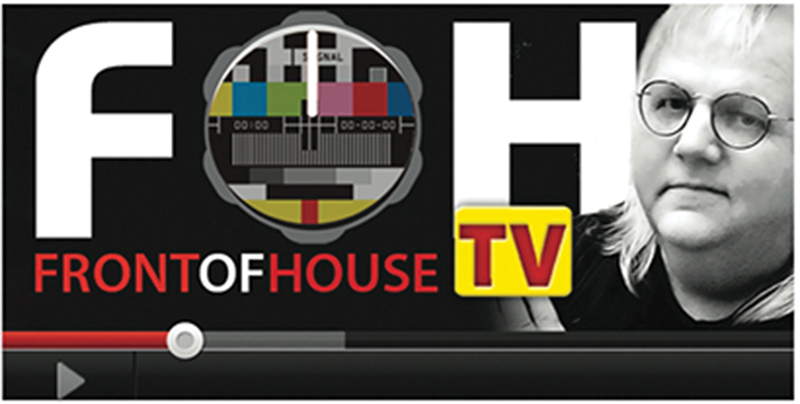 Great sound has to be reproduced in the here and now. A truly live — i.e., not lip-synced — performance doesn’t have fallback amenities of selecting from 75 vocal takes (“I still think I like the last syllable in take 54…”) and endless track comp’ing and editing. Live engineers simply don’t have the luxury of spending five hours perfecting just the “right” hi-hat sound. There’s also the gear side. Rule #21 of live audio is that vintage gear simply doesn’t exist. It kinda reminds me of that old “How many engineers does it take to change a light bulb?… Nine — one to change it and eight to talk about how great the old one was.” It’s no different in the real world. 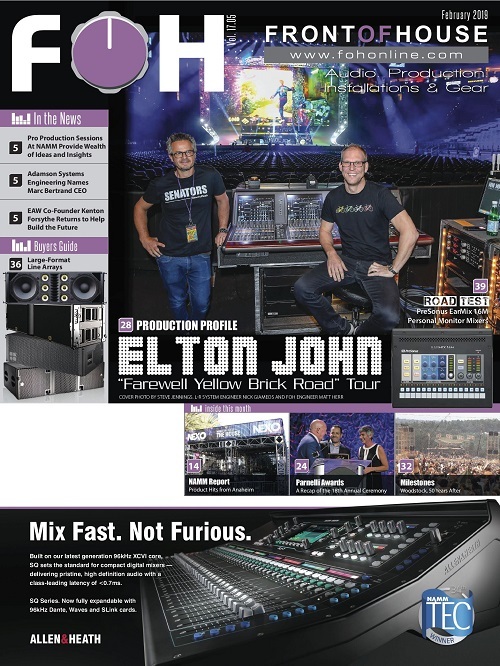 I don’t see any buzz on social media about the joys of mixing on a PM1000 from a bygone era, although there is significant excitement about the new crop of sound reinforcement mixers, ranging from compact rackmount units to full-on, large-format offerings. So where is the live industry headed? 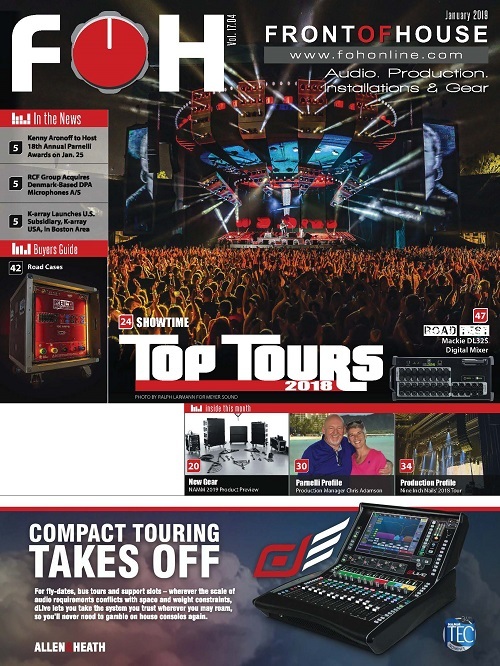 For some answers, see the analysis of the FRONT of HOUSE reader survey on page 40, which includes some fairly startling revelations in terms of the buying power of our “little” audio community. The results are impressive to say the least. This growth in the business is good news for both manufacturers and their customers alike. It’s a positive sign for 2019 and beyond. Here at FRONT of HOUSE, that’s the kind of news we (and our readers) like to hear. Welcome to 2019! We’re kicking off the January issue in style with an expanded Showtime section on the top tours of 2018. Of course, NAMM returns to Anaheim this month, so we’ve got a peek at some new product debuts from the tradeshow floor. 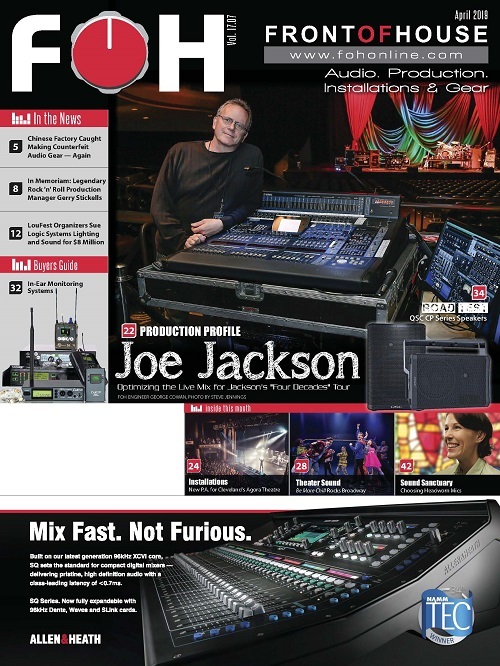 Meanwhile, we chat with production manager extraordinaire Chris Adamson (recipient of this year’s Parnelli Awards lifetime achievement honor); check out the Nine Inch Nails tour; visit some recent nightclub installs; present a Buyers Guide to road case manufacturers; and much more. So if you’re at NAMM, stop by the FOH/Timeless Communications booth (#9914) and say hello, or catch us wandering the show in the new pro audio halls. See you there!